“Libušín” is event paid for mainly by the visitors. So, if we would like to see them again, we need to show them something to remember. Czech republic is full of re-enactment events of various authenticity level and different approach to the visitor – from entertaining amateur plays to large scale battles. 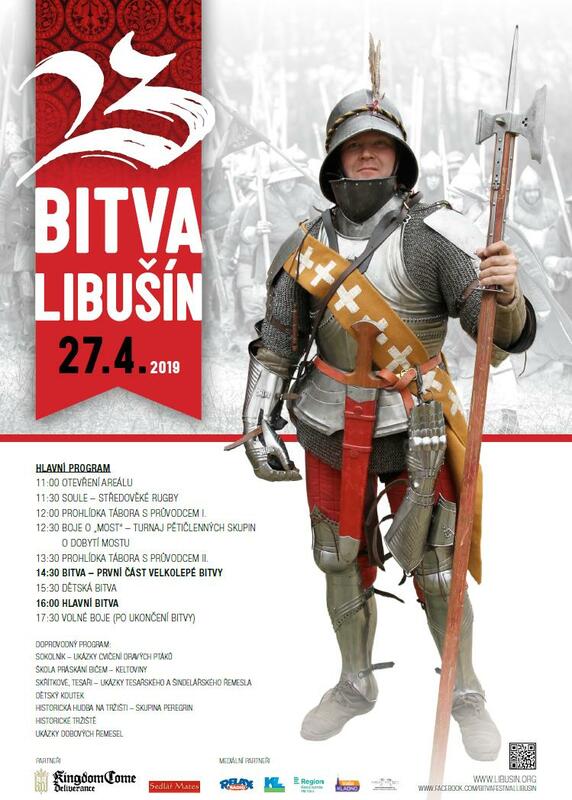 Libušín is the biggest medieval re-enactment event in Czech Republic, so our goal is to show to our visitors not just the fight, but also our interpretation of the spirit of battlefield. Thus we have come up with following hints. 1. Why should I play “dead”, even if I do not want to and will not enjoy the fight? Simple – we have to entertain the visitors, or they will not come again, and also provide fun to our friends in the field. And, frankly speaking, watching couple of “highlanders” hitting each other, occasionally dropping on the ground and then magically springing on their feet again is not such an enjoyable experience. So play along, try to imagine how you would behave in real battle, how frightened you would be, what an arrow or a bullet to the shoulder would do to you etc. The main battle is more of a theater then a tournament, so the goal is not to “survive” as long as possible and “kill” as many as available enemies. You will have plenty of time for this AFTER the main battle, when the free fights begin, or in the HMB tournament! 2. Salvo from handguns was fired at me. What to do? If you are in the first row, quite probably you were hit. Where and how? You choice! Any reaction is better than nothing. You can pretend to be wounded and let the others support you, fall to the ground (and be picked up by your friends in the phalanx) or panic. It will not hold you from the battle and the feeling of battle will be improved! 3. I was hit by an arrow, what shall I do? If you have noticed it, just play wounded or dead. It is possible that you have been hit many times but did not realize it. What do we mean by playing wounded? Just imagine – a nasty piece of wood just pierced your flesh. It hurts like hell and you are bleeding. Help! Mercy! Carry me to the safety! And after you phalanx will come back from the attack, you can join them again. If you “died”, wait either for your fellow fighter to drag you to safety, or wait for you unit to come again to you and join them again under cover of your teammates. 4. A cannon is firing at me, what to do? A huge iron or stone ball is just traveling towards you at high velocity. You are not calm. Panic, die, lie down, be shocked for a while. Or help wounded, be mortified by the carnage around you (your best friend was just torn to pieces)! Again, try to image what it would be like. 5. I was hit, wounded, killed. What’s next? Mostly, you are not killed immediately. It hurts like hell. So do not just lie down (especially lying down with head propped by an elbow, watching others fight, is amazing). Move, cry, scream (do not curse, children are there). This will also notify your colleagues to come to you, try to help you and drag you to your unit, where you can checked for real wounds and be reincarnated out of sight. 6. So can I just stand up in front of the visitors, shake my wound off and go on? No. Never. There is just one exception – when the script tells you to do so. Almost – this is the most important rule of them all: Act, make your own story in the middle of the big battle. Subplots like fallen noble defended by his company, wounded hero catered by his retinue, dying friend in the lap of his mate – all this elevates the main battle from stupid slugfest to a piece of art (kidding, but just partially). Also, never try to “rob the dead” you do not know personally, be reasonable and always think about the visitors. And, believe us, you will enjoy it.